Wait–what’s this? Hmm… on closer inspection, I’d say it’s a #Transformers sneak peek! Yep, I’ve just been PROWLING around Twitter, waiting for my chance to strike with this… well, striking cover by @coralus_SF! One more clue to consider for what’s coming from @IDWPublishing! Is this the #4 B cover that we first revealed as part of April’s Solicitations? Secure pre-orders for the first two issues at your preferred local comic shop and then join in the discussion on the 2005 boards! That'd be interesting. Genderswapping a few characters would be a nice way to mix things up keep things from getting to stale and repetitive. The covers are so inconsequential to me. I want to know more about the story, and what the writer is bringing to it. Everyone mentioned Bee\'s eyes, but why does it look like he has one extra long arm? Huh. Never noticed that. And now I'll never be able to not notice that. Maybe he stole the parts from Animated Longarm? Man this cover art just keeps getting weirder and weirder. Coralus getting published again! Now I'm a little more excited for this new series. But I digress…. If this new Author gives this upcoming book merit and depth and make the Con's a viable threat, then all is well. Bring on the next issue. The Cons probably won't exist to BE a threat considering this is pre-war and Megatron doesn't have his insignia yet. But you're going to give up on issue 2, so I wouldn't be that worried. The designs aren't a huge departure from the previous IDW universe, but they click a lot better for me. Initially I wasn't sure why, but it just hit me…these designs actually have pupils. Something about the faces in the past series (especially MTMTE, because I read the most of that) struck me as slightly creepy and lifeless, despite being drawn with energetic expressions. I think the glowing pupils makes them look more focused and expressive. It might sound kind of ironic since this Bumblebee looks kind of creepy here, but that's more that particular expression. One thing I don't think a lot of people keep in mind is that IDW had two major sides. There's the creative and memorable series like MTMTE, Lost Light, Last Stand/Sins of The Wreckers, etc. These are the series that everyone loves and remembers because they had a lot of freedom. They were able to do what they wanted to do, have the characters they wanted, tell the story they wanted to tell with little to no restrictions. On the other end, there's series like RiD, Optimus Prime, and Combiner Wars. I haven't looked into these much, but from what I've heard the designs and story in these series were much more slavish to the current toyline, and they suffered greatly for that. IDW in its entirety isn't perfect. The half of it that's good is beautiful and some of the best comic book series period. But that isn't the entirety of IDW. Now it seems just by looking at the designs that what we're looking at now, will be closely tied to the toyline. Hopefully there will be a second series running along side it that isn't as restricted. Yeah, I was just thinking this myself. IDW didn't start out /that/ great. I was glad at the time to see G1 favorites reappear in the comics but the earlier part of the run wasn't anything I usually go back and reread. It took awhile for IDW to find its footing. By the time we got to MTMTE, Wreckers, and more they'd been developing the stories for years. So yes, probably should expect to have to be patient as the new team develops the story- and hope that eventually they're given a bit of that freedom to create the really memorable stuff. It does seem to me like nothing good happens anytime Hasbro comes in and insists on dropping everything else for an emphasis of what are basically toy commercials for their current TFs or their other toy lines (like those forced multiverse stories that were always disruptive and confusing to the main storyline- in fact, I think those harmed sales? Certainly turned me off from several issues). Granted, that will always be a factor, since Hasbro IS a toy company and is giving these comics the greenlight hoping they'll sell toys. Of course, if it's fantastic from the get-go I'll be happy to say my worries were unfounded! But if it's the "Adventures of Bee and Windblade with no really developed Con characters"…. yeah, the next few years may not be that exciting for me. Already have that exact theme in Cyberverse. 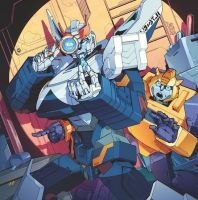 I'm hoping the Prowl and Chromia storyline is interesting- they're not favorite characters of mine, but at least they're not Bumblebee! Plus, Prowl is a popular character who hasn't been overused, so I think that's a good call to have him in the series. I want to see other characters developed, too. (Give Hound some long overdue development, please! He's even in the current toyline!) Personally I don't mind Windblade when she's written right but have felt Bee's been stuffed down my throat since the 80's. (But hey, maybe have a non-murderous Arcee sometimes instead of always defaulting to Windblade now?) Megatron did get mentioned in one of the solicits and I'll hope that he is given an interesting story, too. Soundwave's on a cover, too. As I mentioned before, after his previous and amazing IDW run, it's hard to imagine this Soundwave topping that one, but I hope he's at least got an interesting story here, too. Lol..and ugh, Combiner Wars, the series that had me so excited to see some combiner teams finally get more development and focus- and turned out to be "the story of Windblade, Starscream, and a few other non-combiners with combiners mostly featured as a background prop/MacGuffin". *Grumble grumble* Yeah, hopefully if they do a "combiner" thing again they'll actually FEATURE the COMBINERS as CHARACTERS. *mutter*. Yes, everytime they got a new toy, they had a random new design. they only explained it once with starscream but for no one else. if you notice at the end of Optimus Prime series, Soundwave and shockwave change to their cyberverse designs. That worries me too, IDW most of the time had an ans amble cast which allowed memorable cons like Megatron, Thundercracker, the DJD, Scavengers, and others, the list is a mile long. well, that nugget (if true) takes me form like 2.5% interest to actual 0%. I've never seen something so blatantly corporate-ly desperate as how hard they've tried to make Windblade REALLY REALLY important, but they forgot to make her an actual character people care about first. Maybe 4th (5th?) time will be the charm? Characters usuallybecome fan-favorites because of, well, the FANS. Nightbeat was a nobody 1988 Headmaster with a crappy toy and a cool bio. Furman took it and ran and now Nightbeat is a fan-favorite. Windblade is Hasbro trying to force a character into becoming a fan-favorite, and it’s not working. Let the character have time to grow. Let the fans actually start to like the character before forcing her down our throats. Sadly that's not a surprise since Bee and Windblade are said to be the main characters of this book. Which already has me feeling worried for majority of the Decepticons (pending) who will most likely turn out to be a bunch of bumbling oafs during any dialog or fight scenes against the two. I'll give them 2 issues to prove me wrong. What is with Bumblebee\'s eyes? Hm. Looks good. The style is nice, the chatacter designs are good, but then… Bumblebee\'s eyes… Mother of Primus something is wrong with his eyes. Sadly that's not a surprise since Bee and Windblade are said to be the main characters of this book. well, that nugget (if true) takes me from like 2.5% interest to actual 0%. it's also weird/surprising with the level of focus on the Siege line, that if they are leading the book with those 2, there's been no rumors about either receiving a figure in the line.